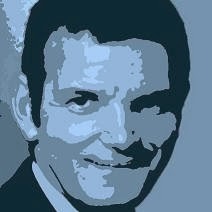 Peter Martin: Without the stimulus what would we have? The scale of the Rudd government's stimulus-funded building spree has become apparent in new figures showing a record $4 billion of public money was spent on non-residential construction in the three months to December - a remarkable 62 per cent jump on the three months before. The $4 billion of public sending on non-residential building is more than double the $1.9 billion spent in the same period the year before. Without it the building industry would have gone backwards in the quarter and backwards over the year. Private non-residential building was flat in the quarter and down 27 per cent over the year. Residential construction slipped 3 per cent. Treasurer Wayne Swan claimed the government-funded building spree as "evidence of the important role economic stimulus has played in supporting jobs and small businesses through the global recession". "If it weren't for our investments in shovel-ready infrastructure... then literally thousands of tradies working in the construction game would have been forced to join the unemployment lines," he said. But there are concerns the building stimulus is so big it is dragging workers away from non-government projects. "We have heard anecdotes that workers were siphoned out of the housing sector to work on the Government’s school program," said RBS Australia economist Kieran Davies. "This might explain some of the weakness in residential construction, although presumably there would have been a pool of workers in the private non-residential construction sector to draw on given that that sector has been very weak." 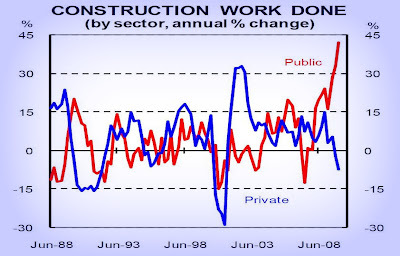 Housing Industry Association economist Harley Dale agreed saying builders seemed to be taking longer to finish residential projects, presumably because their workers had been lured away to work on stimulus-funded school and public housing projects. "We can't obviously prove that. Maybe I am wrong, but it seems to me there is a reasonably large pool of labour that can easily transfer between housing and the kind of non-residentail work that is part of the stimulus. It could beocme quite a hefty constriant by 2010," he told The Herald/Age. The government has set aside $14 billion for spending on school building over the next two years, $6 billion for spending on public housing, and $1 billion for extra roadwork. Shadow Treasurer Joe Hockey again attacked the spending on schools saying it was stupid to keep spending until 2012 a potential recession in 2008 but refused to commit to stopping the program if the Coalition won office. The construction figures show a record $46 billion of work underway but not yet completed; $13 billion of it in Victoria. Victoria topped the nation in construction work done in the December quarter, eclipsing NSW for the third consecutive quarter. It accounted for one-third of all of the extra construction work undertaken in the quarter, more than any other state.
. Are building approvals picking up?